Nothing is more inviting than sitting down to a beautifully set table with people you love. What better time of the year to experiment and have fun with your dining table, than at Christmas time. I had such a blast assembling this tablescape. First, I set up a slim 9″ tree in the corner of the dining room. I wanted to have a natural elements theme for the room and tree featuring pinecones, hand painted ornaments in blue, burgundy, green, and white with crystals, glitter and snow. I got this beautiful set from Frontgate. I added winter anemone blossoms to the tree along with real pinecones, sprayed with gold. A faux fur tree skirt adds to the outdoor element feel of the room. , each one is different and they come in a set of 4. I love folding the dinner napkins under the plate, not only is it a beautiful look, it hides the crease in the napkins! No ironing!! Major time saver!! Real pine needles on the burlap table runner and white hydrangeas are a nice accent coming from the outdoors. These Waterford wine glasses HERE are an elegant compliment to any tablescape, formal or informal..I use them for every and any occasion I can. The beautiful rustic lanterns are also from Pier 1, they were on a great sale that I couldn’t pass up. 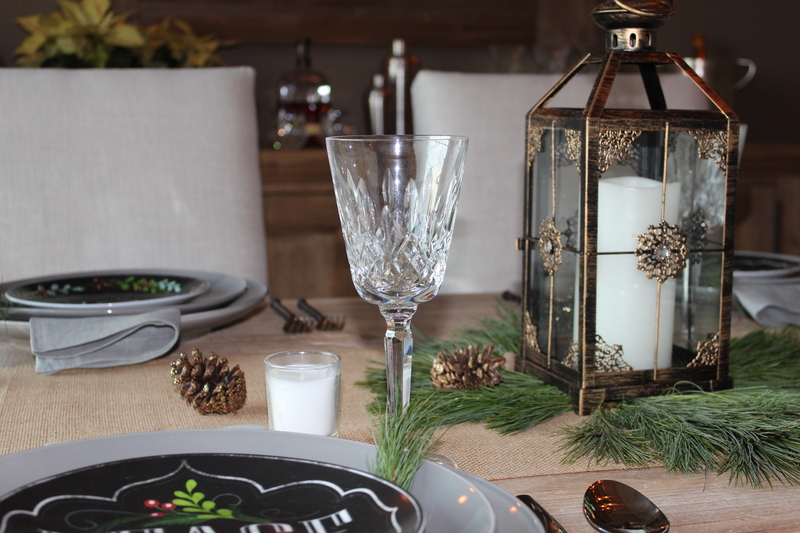 The jewel inserts added that extra bling to the table, and the bronze/black finish is the perfect compliment to the table. The tablescape is a blend between rustic and elegant, burlap and crystal, I love mixing the two elements. The champagne flutes also Waterford HERE have a beautiful curved shape to them, I have collected several different pairs. What do you think? Leave me a comment and let me know. Thanks for visiting. Love the tablescape Denise! It’s great to mix so many textures on one table ….and my favorite part is the white hydrangeas. Amazing how they go beautifully in almost any setting, including this lovely one! Merry Christmas! Blessings on and around your Christmas table this year! Thank you Betsey. There are so many gorgeous combinations for centerpieces, I love creating beautiful tables. I have so many ideas, can’t wait to try them for upcoming holidays. Merry Christmas to you and your family! I love Christmas, I am always ready for this season. And already I am thinking of what and how I want to do everything about it when the season arrives. I love your colour in this set up. They are beautiful. I’m thinking about Christmas as well! My favorite season 🙂 Thank you!